Height x Width: 4 in. x 18 in. 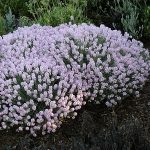 Greek Yarrow is a slow-growing, tidy, dense evergreen ground cover. 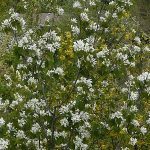 This beauty is a reliable heavy-bloomer bearing bright white clusters of tiny flowers for many weeks in late spring. Attracts bees and butterflies. Height x Width: 6-12 in. x 28 in. 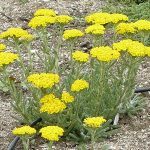 Woolly Yarrow is a low growing evergreen ground cover forming loose clumps of charming, fuzzy grey-green leaves.Clusters of cheerful yellow blossoms pop up in late spring. Attracts bees and butterflies. 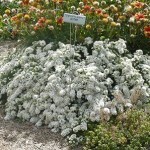 A natural hybrid from Bulgaria, this unusual and charming miniature yarrow produces clumps of small white flowers over carpets of attractive silvery leaves. Expanding gradually by root, this plant can form loose colonies. 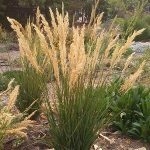 Height x Width: 36" x 36"
This graceful clump grass produces multiple silvery spikes in late spring. The seed heads persist throughout the growing season and remain beautiful into winter. 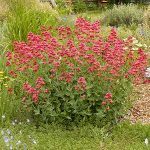 Height x Width: 24-26" x 24"
Texas Hummingbird Mint produces tall spikes of tubular purple flowers, highly attaractive to Hummingbirds. 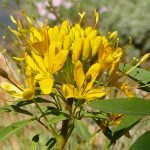 Also a good nectar plant for bees and butterflies. Blooms in the heat of mid to late summer. 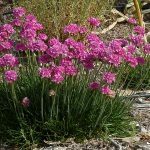 Multiple spikes of purple flowers in summer provide an excellent resource for pollinators. 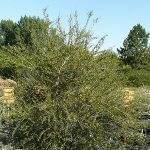 Bushy, vigorous, great foundation plant. 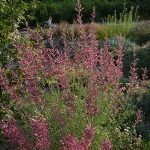 This compact Agastache, or ‘Hummingbird Mint’ bears dozens of upright stalks of purple tubular flowers which–of course!–attract hummingbirds. Because of its compact form, it can be used to create spectacular small ‘hedges’, bringing color to the late summer garden. Height x Width: 36 in. x 18 in. 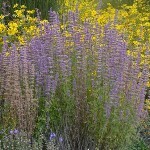 Threadleaf Giant Hyssop has numerous spikes of uniquely-colored orange-purple tubular flowers over fragrant, finely divided leaves. 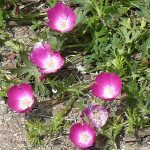 It blooms in the heat of mid-summer and persists into fall. 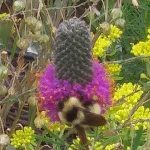 Outstanding hummingbird plant and nectar source for bees. More info here. Height x Width: 12-18" x 12"
True to its name, Nodding Onion produces lovely drooping clusters of pale white or purple flowers in mid-summer. Supports butterflies and native bees. Deer resistant. Foliage is evergreen. 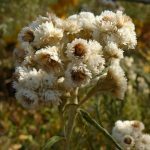 Height x Width: 1-3 ft. x 1-2 ft.
Pearly Everlasting is a sturdy, undemanding native wildflower that can be grown in dramatic drifts in sun or part shade.Hundreds of glowing, white flowers atop woolly, erect stems account for its “pearly” appearance. Fine food source for butterflies. More info here and here. 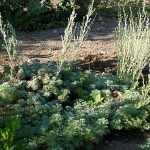 This low, compact sagebrush relative makes a perfect rock garden plant. 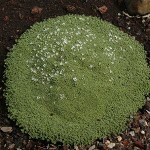 Fluffy flowers arise in early summer, can be cut back to reveal the evergreen mat. Choice! Height x Width: 12-18 in. x 12-24 in. 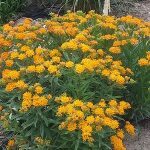 Butterfly Milkweed has thick umbels of bright orange flowers over narrow leaves. Central U.S. native supporting Monarch Butterfly larvae. More info here. Height x Width: 2-3 ft. x 2-3 ft. 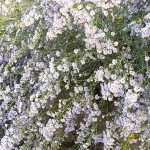 Despite its common name, the flowers of Sky Blue Aster are more lavender than blue. But this Aster puts on a brilliant show in fall, each plant covered with hundreds of beautiful blooms. 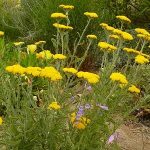 Growing well in almost any soil, from dry sand to moist loam, it attracts butterflies and bees. 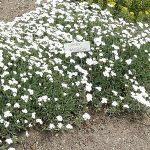 Snow Flurry is a fall-blooming Aster that creates low-growing dense ground cover carpeted with tiny white flowers in September and October. 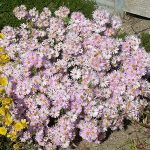 A good strong grower and a totally new look and use for Asters! Makes an excellent container plant. Cut back in spring. 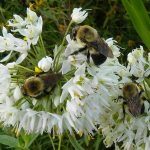 Attracts native bees, honeybees and butterflies. 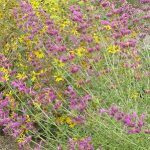 Aromatic Aster is an exceptionally vigorous spreading groundcover. 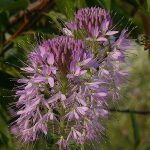 In late fall it bursts into bloom with myriad pink flowers, which provide nectar and pollen for a variety of bees and butterflies. Height x Width: 12 in. x 24 in. 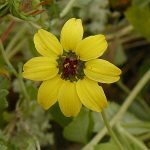 Chocolate Flower: Cheerful wispy yellow daisies keep coming all summer and actually smell like chocolate! 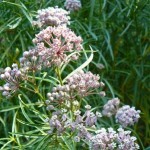 Attracts butterflies, honey bees and beneficial insects. Height x Width: 10-15 in. x 10 in. 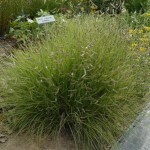 Blue Grama can be used as a xeric lawn grass or as a stand alone specimen grass. Unmowed, it forms a tight mound with interesting and graceful seedheads that look a bit like bushy eyebrows waving above the mound by mid-summer. 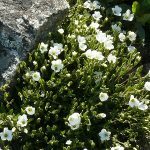 It could star as an accent in a flower bed or naturalized meadow setting. To avoid aggressive seeding, cut back seed heads in fall. Height x Width: 15 in. x 18 in. 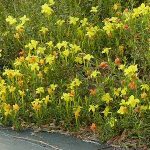 Hartweg’s Sundrops produces masses of cheerful, clear yellow blossoms throughout the heat of the summer and into fall. The yellow blooms age into burnt orange creating a two-tone effect. Easy-and reliable. Needs well-drained soil. Attracts: butterflies and bees. 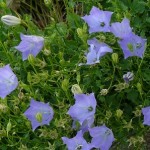 Carpathian Harebells is a more compact version of our native harebells, with larger flowers and a later bloom time. Charming! 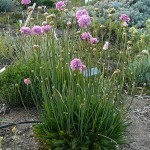 Jupiter’s Beard produces masses of crimson flowers fading to pink from late spring right through the summer. 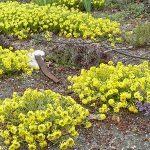 Periodic deadheading will enhance the bloom even more. Attracts Swallowtails and Monarchs. Can seed out somewhat aggressively. Height x Width: 8 in. x 15 in. 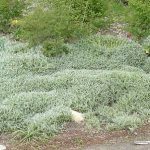 Snow-in-Summer is a lovely evergreen groundcover, attractive even in winter. 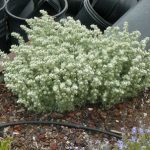 The fine silvery foliage is covered with masses of white blooms in late spring. 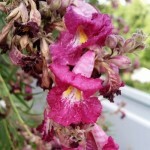 No pruning necessary, but faded flowers may be sheared. 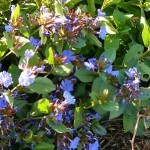 Valuable as a shade-tolerant groundcover, Plumbago will also grow in full sun. Glossy deep green leaves and lovely blue flowers with striking red calyces make this a most attractive spreading groundcover. 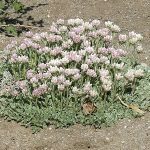 The plant vanishes in winter, but comes back reliably each spring.